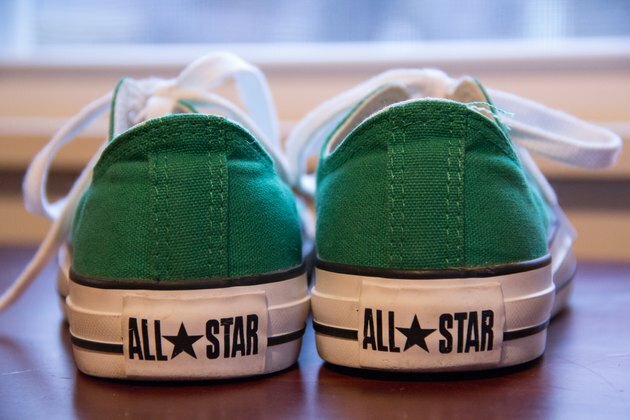 Each time you put on a pair of Converse sneakers, you are donning an icon of the sneaker industry that began when the company founded in 1908. In the 1920s, Converse became the first endorsed sneaker, thanks to basketball pioneer Chuck Taylor. Later, his self-branded Converse All Stars dominated basketball courts of the newly formed NBA in 1949. With such a rich history backing your Converses, they're worth keeping clean and looking good, which is challenging for white sneakers. However, a small amount of bleach is helpful in keeping your sneakers as white as possible. Roll the T-shirts and stuff them inside your shoes. This will support the outer walls of the shoes while you clean them. Dump 1 oz. cleaning detergent and a capful of bleach into a large bowl of warm water and mix. Remove the shoelaces from your sneakers. This allows you to clean the areas of the sneakers typically covered by the laces. Put the laces in the bowl of water to soak as you work. 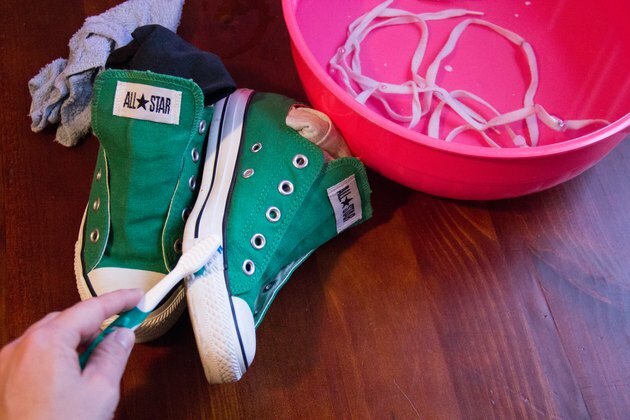 Wet a cloth, squeeze out excess water and then wipe your converses with it. Rub the sneaker surface with circular movements. Wet the cloth as necessary to allow the cleaning solution to work on tougher stains. Dip the head of the toothbrush in the bowl and brush areas of the sneakers that need fine tuning or that have caked-on dirt. Brush the side sole of the sneakers for additional cleaning of the pitted surface. Wet the second cloth with plain water and thoroughly wipe the cleaning solution from the sneakers. Repeat one to two times to ensure all bleach is removed from the sneakers. Allow sneakers to air dry. Remove the laces from the water and rub them between your hands vigorously. Rinse, dry and then replace the laces. Use a proportion of bleach to water that is less than 1/16. 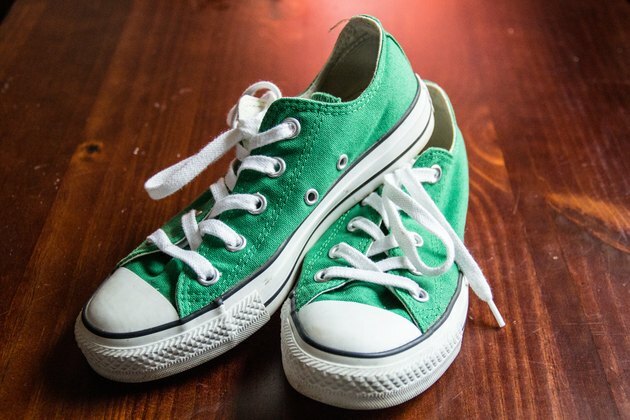 Too much bleach will stain your sneakers and weaken the material fibers.